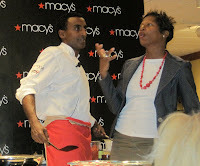 I had the good fortune to attend a cooking demonstration by Chef Marcus Samuelsson recently. I say good fortune for two reasons – first, I was asked to attend by Jaden Hair, the brilliant mind behind Steamy Kitchen and the Food Blog Forum. I’ve long admired Jaden’s work, both her recipes and her photos make my stomach growl. Second, I was thrilled that I would have the chance to meet Marcus Samuelsson. I ate at his restaurant, Aquavit, 23 years ago, when he was the newest chef sensation in America. To this day, I can still recall every bite of that dinner. Oh, there’s one more reason! 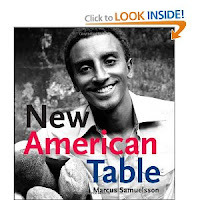 His expansive new cookbook New American Table. I can’t stop turning the pages. Beautiful photography and exciting recipes! 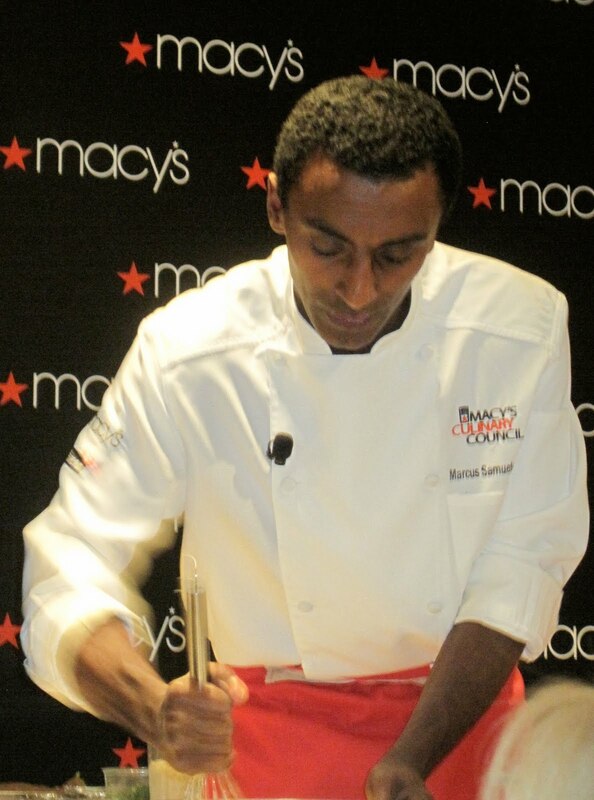 Samuelsson, born, and then orphaned, in Ethiopia, and raised by adoptive parents in Sweden, is one big combination of flavors, so it’s no surprise his food reflects that fusion. He’s clearly been influenced by his time in the USA, too, and that was the inspiration for the recipes throughout this new cookbook. Chef Samuelsson is charming and affable. He cooked three dishes, each infused with his signature touches . Seared Gravlax on Corn Cakes, Crab Cake (smashed yukon gold potatoes used at 30/70 ratio with crab) with Pistachio Aioli, and Fried Chicken with Collards. The audience was offered a taste of everything. Luscious is all I can say. With each demonstration he called a member of the audience up and made the whole experience charming, funny and inclusive. He describes food as storytelling. Food is something we all share – as opposed to religion or politics – people come together over food. This is why he believes the issue of food and culture is so important. In food we marry and combine food to tell stories. He is interested in authentic food, and even the cross cultural foods he creates are still very much authentic. This woman had to be convinced to eat gravlax. She sort of liked it. She really liked Chef. A lot. If you’re watching Top Chef Masters this season, you’ll get a sense of how Marcus cooks. His deconstructed spin on Indian food for this week’s Simpson’s challenge was a classic example. 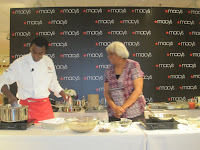 Here is a link to the Flickr photostream from the Macy’s event. 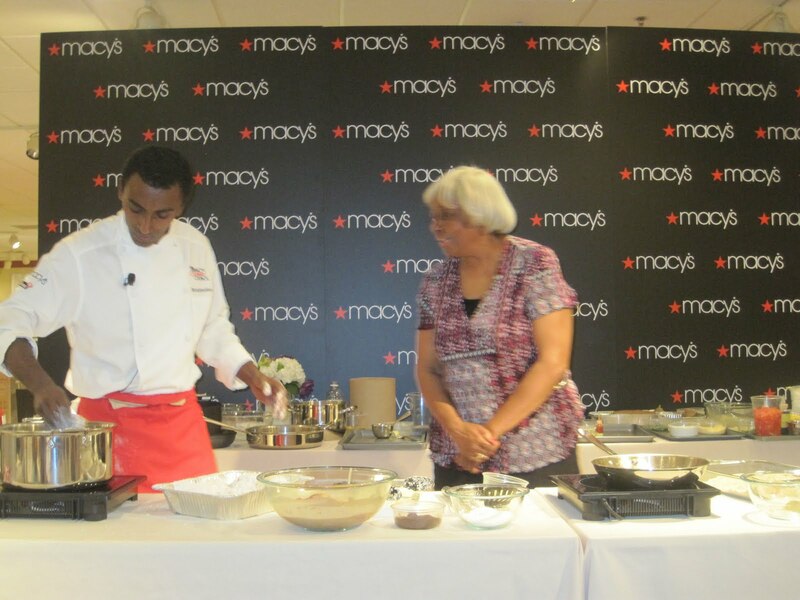 Thanks to the Culinary Council and Macy’s for bringing Marcus to DC. Here’s the sassy Steamy Kitchen post about the event, including a little video I did. Thanks so much for the opportunity and the shout out, Jaden! And that salmon sandwich is the next thing I’m making from this cookbook! 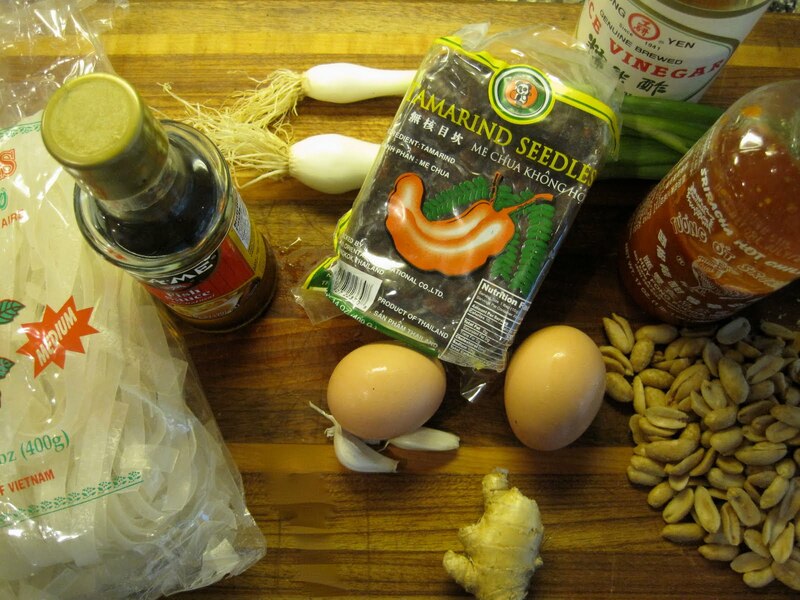 I decided to try Chef Samuelsson’s Pad Thai recipe and all I can say is DELICIOUS. I just loved the chili spiked vinegar dressing. While this is not a cookbook for the casual cook – more for experienced kitchen adventurers – I’m having fun with it, and I’ll bet you will, too. I will admit to some adaptation – mostly due to ingredients missing from my pantry, but also to reduce the number of saute and other pans used from five to two. 2 c steamed broccoli would have been a pretty addition to the bowl. 1. Make chili vinegar: warm all the ingredients just to a simmer. Simmer a couple of minutes and set aside. 2. Prep the rice noodles. Bring 1 qt of water to a boil. 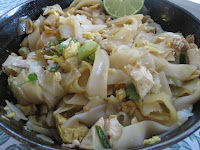 Remove from the heat and add the rice noodles. Stir gently and allow the noodles to soak for 30 minutes. Then drain and toss with 1 T canola oil. Put in the serving bowl. 3. Scramble the two eggs in 1 t. canola oil and add to the noodles. 4 In a wide saute pan, heat 2 T canola oil and add the ginger, garlic, red pepper, fish sauce, tamarind, soy, sugar and sliced scallions. Cook quickly on medium low heat for 5-6 minutes, until the scallions are just starting to wilt. 5. Add peanuts, chunks of scallion and chicken and stir to combine. 6. Add this combination to the noodles and stir and toss until everything is coated well. 7. In a large wide serving bowl, plate with warm steamed broccoli and scatter cilantro or parsley and thai basil over everything, then sprinkle with some of the chili vinegar. Your pad thai looks better than any I have been served in Thai restaurants – when's dinner? !